You could soon be sending the doctor your nail clippings – especially if you’re one of the 300,000 Irish people with osteoporosis. AN IRISH FIRM has been handed €1.5million in funding for an invention which uses toenail clippings to predict people’s risk of developing osteoporosis. Crescent Diagnostics, which is marketing the product developed at the University of Limerick, announced today that it had secured the capital for its venture, which it said would “significantly enhance” the diagnosis of the condition. More than 300,000 people in Ireland currently suffer from osteoporosis, which causes bones to become weak and fracture easily. It is currently diagnosed with a bone density (DXA) scan. However, the UL research has shown that chemical bonds in the human toenail are closely related to hip fracture risk and can be used to quickly predict osteoporotic breaks. The firm has developed its own test, called BQT, to assess nail clippings. The investment will come from capital funds at AIB and Bank of Ireland, alongside Seroba BioVentures. One in every two women over 50 will suffer these fragility fractures in their lifetime, as well as one in five men, according to the Irish Osteoporosis Society. 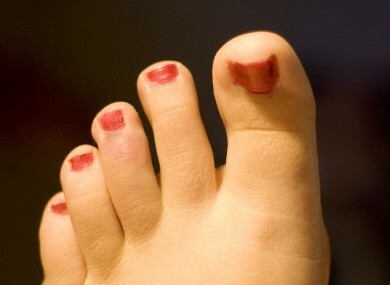 Email “Toenail test lands Irish company €1.5million”. Feedback on “Toenail test lands Irish company €1.5million”.